6:14 p.m. Friday: Just passed Seeley Lake. Holy cow, this summer weekend traffic is terrible. But at least the drive is scenic. I’m pretty sure the Great Divide Mountain Bike Route paralleled this highway. I wish I could remember exactly where it was. 7:47 p.m. Finally arrived at the Jewel Basin checkpoint, mile 68. There are at least a dozen other volunteers here right now. Some are just drinking beer and building a fire in the shooting range field across the road and others are setting up a tent. It seems the supplies have not yet arrived. No runners through yet. The race began 12 hours ago, at 7 a.m.
8:23 p.m. Danni and I drove to the next checkpoint, Strawberry Lake, mile 74, which is on the private property of this awesome caretaker named Pete, who is a former Marine pilot and Vietnam vet. Pete is taking a sabbatical in the Montana wilderness to write a book about his life, and has been hugely generous with the Swan Crest 100. We loaded up Danni’s car with boxes of food and water to take back to Jewel Basin. 9:05 p.m. We set up Jewel Basin tables with lots of good stuff — brownies, cookies, Swedish Fish, grapes, crumbled bacon … I think there might be some Hammer Nutrition stuff thrown in, too. Rumor has it that the Swan Crest 100’s main opponent, Keith Hammer, is lurking around with a video camera and a clipboard, hiding in bushes and documenting the environmental misdeeds of the race. The guy fought this race venomously during its planning stages, threatening litigation and forcing the organizers to return all of the entry fees and hold the race on a donation-only basis, with no more than 75 participants and volunteers. His main argument was that these runners were going to disrupt grizzly bear “security zones” and cause other unspecified environmental damage. As far as affecting the land, I'm not sure if you can be much lower impact than a person traveling light and fast on foot, but whatever. Basically, Keith Hammer seems to think he owns the Swan Mountains and opposes anything resembling a commercial enterprise, as well as activities that don't fit into his paradigm of a good wilderness experience. I hope his troll-like lurking will reveal the truth about ultramarathons and the unique and incredible experience of pushing the limit of human endurance in a beautiful landscape. 11:30 p.m. The first runner just came into Jewel Basin! Dan Barger. I think he’s from California. He doesn’t even look winded yet. 12:45 a.m. Saturday: Back to Strawberry. I think Dan beat us here. 1:10 a.m. Starting to get really cold and hungry. I left all of my own gear at Jewel Basin. I felt bad about it but I ate some of the race food and wrapped up in one of the race blankets. I’ll give it back if a more deserving person stumbles in. 2:30 a.m. Two more runners in. We made hot chicken broth but one guy turned it down; he’s doing the whole thing on Hammer products. Rough. The runners look frazzled but I envy them. You can tell they’re deep in that special place where physical pain gives way to psychological elation. 3:15 a.m. Most of the other volunteers are taking catnaps. Danni and I are starting to fade, too. We’re giggling hysterically at pretty much everything. I feel like a 12-year-old girl at a back-yard sleepover party. Oh yeah, I ate a few more Swedish Fish. I’ll reimburse the race directors later. 4:00 a.m. The first woman just came in, a Czech woman named Eva. She actually started the race a half hour late because she unknowingly set her watch to the wrong time zone — Pacific instead of Mountain. She’s doing really well. I heated a bowl of ravioli for her and she was so giddy about it. It gave me a warm fuzzy feeling because I’ve been there before, or at least close to there, but I know when you’re there, nothing beats a bowl of steaming hot mush. 4:30 a.m. Danni and I just went back to check on Jewel Basin. Everyone was asleep except for one woman, Kim, who looked a little stressed. 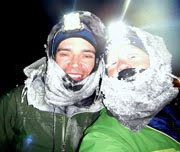 5:02 a.m. We drove back to Kalispell to pick up Danni’s husband, Ted, who’s going to man the last checkpoint by himself. We’re hoping we beat the lead runner, Dan, to it, because right now there’s nothing there. We dropped off Ted with a camp chair, a few coolers of water, and a box of food. The wind is howling and the temperature is in the mid-40s. I hope Ted has a coat. 5:55 a.m. Just arrived at the race finish, a private campground outside Columbia Falls. The sun is coming up. Danni and I still have the giggles, but we’re asleep on our feet. Coffee does nothing. We’re going to take a nap. 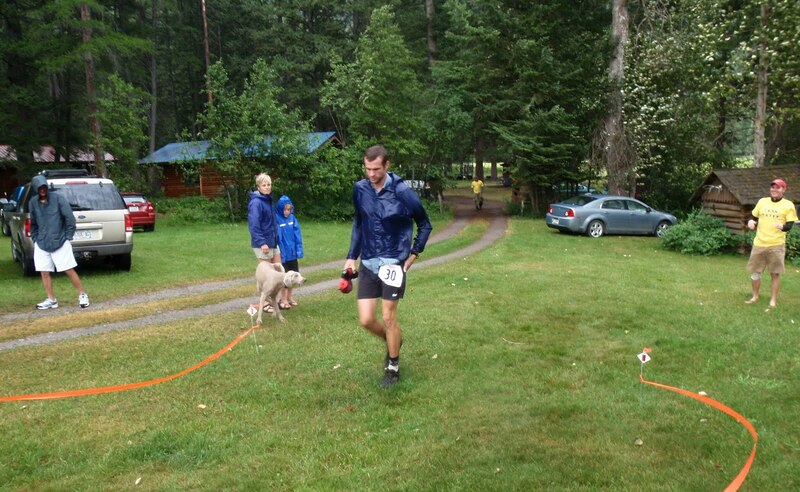 Justin Yates finishes in third place after 27 hours. 8:23 a.m. I woke up and Danni was gone. This huge thunderstorm just blew in —heavy rain and lightning. I stumbled outside and the other race directors were there. Brad, the main race director, informed me that my job is to now accompany him around town on errands for the after-race party. I think longingly about my mountain bike back at Jewel Basin and wish I could ride it on the race course, but I’ve already accepted that my job is race director lackey. It is not a bad job. 12:11 p.m. Brad and I just ran around all over Northern Montana picking up coolers, paper towels, a keg, 45 pounds of elk steak, 12 bags of spinach and romaine lettuce, salad fixings, a big garbage can for the keg, 50 pounds of ice, cups, plates, forks, 10 gallons of ice cream and dry ice. Now we’re at a little coffee shop in Whitefish waiting for an order of crepes. I realize that except for the little bit of race food that I stole, this will be my first meal since lunch, 24 hours before. Brad informs me he’s been awake for more than 48 hours. His face is pale and he has that crazy-eye thing going on. We both ramble on and on in a mutual stream-of-consciousness full of silly nonsequitors; it’s OK, because neither of us is going to remember this conversation in a few hours. 2:45 p.m. Brad just dropped me off so I could pick up my car. Driving behind him, I see his truck is moving a little wobbly on the gravel road. We both roll down our windows and wave at each other, mutually confirming the other's consciousness. 4:03 p.m. Back at the finish. Grill is going, and there’s not much left to do until clean-up time. There’s only about a dozen runners in, and we’re 33 hours into the race and three hours from the race cut-off. This is a hard race; I think harder than anyone realized, even Brad. 5:06 p.m. Had a chance to chat with a lot of the runners. 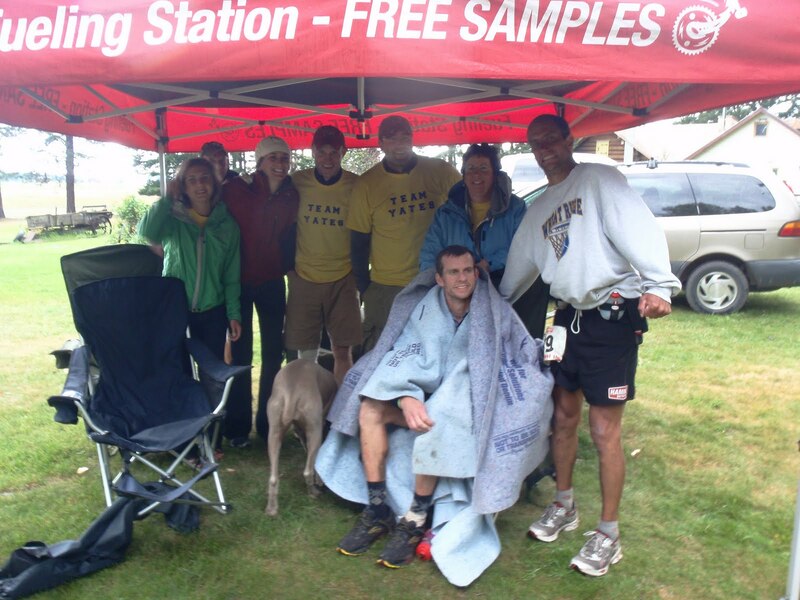 Several had just finished their first 100-mile attempt. Some had jumped right up from marathons or 50K runs. Their sense of accomplishment shines through their frazzled, stiff-legged demeanor, and it’s inspiring. They’ve all taken off their shoes, and I want to stay far away from those. 5:54 p.m. This cute Swiss runner, Beat Jehgerlehner, just finished. He still looks strong and smiley, and he’s already using up valuable energy to goad me into running the Swan Crest 100 next year. And the strange thing is, I kinda want to. I've never run a foot race longer than eight miles. I considered with great interest and seriousness how long the buildup to 100 miles would really take. 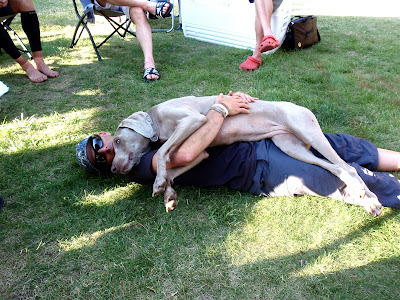 Brad and Zella deflate together at the end of two very long days. 7:01 p.m. The official race cut-off just passed. All of the finishers made it in with 20 minutes to spare. Twenty people out of 44 finished, including three women. All in all, the 101-ish-mile race had at least 23,000 feet of climbing, long wilderness stretches without resupply or bailouts and, according to the runners, a ton of blown-down trees over a rough and technical trail. Dan won the race in 24:34:00. Eva won the women’s race in 28:03:00. A huge wave of relief just washed over Danni’s face, because Montana’s first 100-mile ultramarathon ended without a big incident. A few people got lost for a little while, but everyone has been accounted for. No grizzly bears were harmed in the race, but one canister of bear mace was discharged accidentally near a checkpoint. That would probably explain why my nose has been burning like crazy all morning. 7:54 p.m. Brad just gave the big congratulatory speech. I’ve only seen the shiny surface of the big, dirty endeavor that encompasses planning a race, and even I feel a little like I’ve been run over by a truck. I can only imagine how hard these people have worked over the past many months, but I admire them. It really is a cool thing, and I am proud to have had a small role in it. How cool to be a part of something like that! It would definitely whet my appetite to participate the next year...but 100 miles...wow. Not yet. Ok so Swedish Fish are candy, I was concerned you were eating Herrings or something. Keith Hammer's crowd sound a bundle of fun! After riding the Squaw Peak 50 trail run route (and bonking hard, but that's another story) I'm looking back on the trail with the thought that maybe I'd like to run it one day. Sounds like a great time and most excellent race. FYI Jill, I'm sure that cultures vary, but I've never hesitated to grab snacks from the tables when working an event. Most organizers know that the volunteers need to be taken care of or they won't come back. We get a lot of food donated, and we don't run out, so I'm not taking anything from the participants. I know some events run short of supplies, but that is one of the first thing a good organizer has to learn how to plan. We also give our volunteers free registration to another event during the year, or try and work them only one half day, and they can do the shorter event options after.